Kissack Adventures: And We're OFF To The Races!!! And We're OFF To The Races!!! Ice cream day finally arrived ... and it was a lovely day, to say the least. Beautiful sunshine, low 70s ... it doesn't get any better in the desert!! Here's most of our group with about six people missing. Four of us were off to Costco to pick up the spoils for the event of the day ... the ICE CREAM SOCIAL. You cannot imagine how important it is to someone who owns a Prevost to get their 50 cent ice cream bar. Lucky for me, we were able to borrow a pickup truck from a member. Of course we left early, just in case. Not having done this before, I had no idea how it would work out. We had just hand loaded all the boxes into the truck when I looked at my watch. Uh oh ... it's only 11:00. We have an HOUR before passing out the bars. Instead of heading to the grassy knoll where all the action was, we made a beeline for the freezers and UNPACKED all 144 boxes. That gave us about 15 minutes to rest before the big rush. 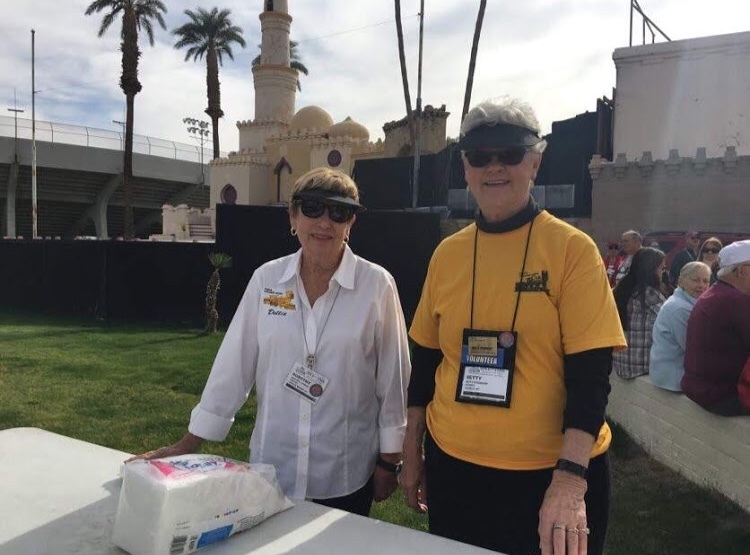 Here's two of our beautiful table girls, Dottie and Betty, ready to make a couple thousand people VERY happy. If you like ice cream bars, I'm here to recommend these babies. Eighteen in a box for the measly price of $9.99. They were a BIG hit. Everyone oohed and awed over the thick chocolate, and only two complained about the nuts. At long last, the rush was on. It was a little difficult to keep up with the crowd, delivering boxes with the golf cart while trying to deliver to those who can't come to the party. In the end, everyone did a fantastic job of making a lot of people ice cream happy. There wasn't even any fights over "my wife is in the RV not feeling well because of her diabetes ... I need two bars"!! The clouds kept us perfectly cool and the ice cream frozen until the last delivery. In spite of a rise in the number of rigs, we didn't have as many people as previous years, so of course I have ice cream left over. Hopefully that won't be a problem ... because today we do it all over again!! This time however, it's scooped and covered with chocolate or caramel sauce. Yup ... another trip to town, this time to Smart and Final, for buckets of the cold stuff. I had to show you this picture. Tom, one of our most ardent train fans (many in his family worked for the railroad) found this very cool shirt at the vendor building. It's covered with pictures of trains. After showing it around, it became so popular that several others ordered the same shirt. It will be perfect for our Promontory Summit rally in May. I'm so very thankful the ice cream social went off without a hitch. The best part is that I wasn't worried even one second about whether the ice cream would be delivered or not. Unlike Schwans, I both called myself and sent myself an email that it would be there on time!! I'm liking his new delivery method. LOL, so true about the 50 cents ice cream bars for the Prevost owners. Glad that you kept them happy and everyone else as well. Now to it all again today in a different style, nice when things go smoothly. Boy howdy ... I do like it when everything works out as planned. That would be disaster, Patsy!! We did good though ... almost TOO good. Good job handling the Ice Cream Social without a hitch. The slightly cooler temperature due to the clouds probably helped stop those extra Ice Cream Bars for the partners back at the rig from happening. That's one busy Train Shirt. Be Safe and Enjoy some down time. You are right Rick ... the cloudy skies kept the ice cream perfectly cold. You certainly do get the ice cream ... TWO even. I had no idea about lithiums, but the rep said they were too expensive to manufacture here. They all come from China?? Yessirree!! 22 grams of carbs, not that I count. I guess I can eat this bar I was saving for you.